The first point to emphasize is that Chairman Ye Jianming is not the recently-departed Lt-Gen Ye Xuanning’s son or Marshal Ye Jianying’s grandson — contrary to my own and others’ earlier best guesses as to his background. As i’ve noted in updates on the previous post on the topic, several knowledgeable sources have confirmed this with increasing certainty over the past couple of years. At least two Chinese media reporters have recently snooped around Ye’s home village of Guanqian, on the upper reaches of a Min River tributary in Fujian, in the process confirming his humble origins among a family of boatmen. Chairman Ye’s father is named Ye Naiqing (叶乃清), and his late grandfather was Ye Liuchun (叶柳春), after whom he has named educational initiatives in Jian’ou City where he went to school. Extraordinarily, however, just as any blood ties to Marshal Ye Jianying were finally disconfirmed, strong evidence emerged of a different kind of close connection with the family of the PLA’s great commander. In 2015, a HK$277 million investment was made in Hong Kong’s Mei Ah Entertainment by a consortium called Carrier Capital (凯利资本). This name, in Chinese, is shared with with the PLA’s Carrie Group business empire that was headed for many years by Ye Xuanning while he was GPD Liaison Dept chief. This new entity Carrier Capital is controlled by Chairman Ye Jianming and other CEFC executives, together with a person referred to in English as “Yip Ching-tsz.” Rendered in standard pinyin, that is Ye Jingzi (叶静子) — which happens to be the name of the eldest daughter of Ye Xuanning, and the granddaughter of Marshal Ye Jianying. So CEFC’s Chairman Ye was not born a member of the Ye Jianying clan, but he certainly has very intimate business ties with them. While there has been gossip about a romantic aspect to the relationship, i have found nothing to support that. The Chairman and his wife Wu Liqiong (pictured below) have been married for 15+ years and evidently remain close partners. Ye Jingzi, meanwhile, is married to Wang Jingyang, grandson of another PLA immortal, Wang Zhen. Ye Jianming and Wu Liqiong. Ye founded CEFC in his twenties. After a brief stint with the forest police in his home southern province, Fujian, he says he bought oil assets from auction once owned by a businessman named Lai Changxing, who fled to Vancouver in 1999 to avoid arrest after authorities discovered that he ran a large smuggling ring. (Lai was eventually convicted and sentenced in China for smuggling and bribery.) Ye got the funds for the purchase from wealthy investors in Hong Kong and Fujian, a province with a reputation for producing astute businesspeople. Ye pitched to those investors an oil business that would operate alongside China’s state oil companies, in the gaps those companies left open. At the time, China was hungry for crude, but its state-backed companies were having difficulty closing some deals abroad. The optics of China’s state-backed giants marching into a country to buy and extract oil weren’t great for central Asian politicians. This paved the way for private, under-the-radar firms like Ye’s, which can strike oil deals in Europe and the Middle East where SOEs would bring political liabilities. Based on this, Ye is very much a self-made man. But his comments in the interview leave many unanswered questions. Who were these Fujian and Hong Kong investors, who presumably still own most of the company? What were the circumstances of its original establishment on January 1, 1980, and how did it come under the 25-year-old entrepreneur’s control in 2002? And if the whole strategy was based around appearing not to be an SOE, why all the redder-than-red imagery and party-state nomenclature in the company’s structure? The Fortune interview generated an unprecedented surge of attention in China: Only 39 years old, China’s youngest Fortune 500 boss makes first appearance! Many observers were stunned to find they had never heard of a Chinese company significantly larger than famous national standard-bearers like Wanda, Vanke and Baosteel. But it was hard to miss the disjunction between this explanation and the assiduously low public profile Ye and his company have cultivated over the past 15 years. Other PRC media have tried harder to enlighten their audiences. One investigation from Yema Financial attempted meticulously to disentangle CEFC’s network of financial holdings; that story has been deleted from mainstream sites and weibo. Another traced some of his early efforts in business under his original name 叶建明, which he changed to the current 叶简明 in 2006. A Beijing News feature story interviewed former Ye employees in Jian’ou, who said his pot of gold began to fill when he snapped up a profitable local state-owned piston factory for 20 million RMB in 2003. After re-branding it as the Juli (“Great Force”) Piston Company, Ye then merged it with businesses dealing in fire equipment, food, wood and hygiene products, which he had established with his wife under the brand Xinye (新叶). Ye and his wealthy investors purchased Lai Changxing’s confiscated Xiamen Huahang Oil Company at auction in June 2006, and its oil wholesale licenses were transferred to CEFC in May 2009, according to Ministry of Commerce records seen by the Beijing News reporter. The paper deleted is own story quicker than Google or Archive.org could catch it, and it has since been scrubbed from other news sites. The China Business Journal also visited Guangqian in December, finding other hints as to the provenance of the Chairman’s fortune. Billboards at the newly renovated Ye family ancestral hall indicate his basic strategies have included: (1) using lines of credit to corner the markets for PX and similar bulk chemicals; (2) investing in coastal provinces’ energy SOEs; and (3) international energy trading through “policy banks” (政策性银行). The Chairman’s interests in PX (a chemical with deeply negative connotations in China) and the piston factory (cheap SOEs selloffs have also prompted public ire), together with his oil trading enterprise’s roots in Lai Changxing’s smuggling syndicate, might help explain his determination to avoid the limelight. The company’s red image and patriotic posturing, too, might be primarily insurance against social and political flak. But the company’s official website, publicity materials, and in-house publications all use the party-state’s peculiar political language with an unwavering intensity that would be difficult to maintain without a deep and serious knowledge of, and commitment to, the CCP theoretical-ideological system. Likewise, the tenets of Ye Jianming Thought discussed later. The Beijing News report mentioned briefly that multiple Guanqian residents and Ye relatives said he joined the army as a soldier after finishing school. But none of the stories mentioned above (including Fortune’s Chinese version) discussed the evidence of PLA links that has continued to accumulate in the public domain. Chairman Ye granted his interview after Czech journalists highlighted evidence of his ties to the PLA. In particular, they had noted that the 2012 Annual Report of CEFC International Ltd, a Singapore-listed company majority owned by Ye himself, stated that from 2003 to 2005 he served as Deputy Secretary-General of CAIFC, the best-known platform of the Liaison Department of PLA General Political Department (GPD-LD). The GPD-LD is responsible for an area of military political work that has traditionally included externally-directed propaganda and the cultivation of ties with foreign elites in countries the CCP regards as ideologically hostile. He says he was invited to become a director on CAIFC, but declined. He believes CEFC’s smaller partners in China have tried to inflate his role with the government for their own benefit, which is why his name appeared in the old biographies. “Actually,” he says, “I’ve received invitations from the People’s Congress, the People’s Political Consultative Conference, associations related to foreign affairs, the institute of international relations in China….all to undertake some role or duty in their organization.” He says he declined all the invitations. Back in March, letters from CEFC lawyers threatened legal action against several media outlets and think tanks who raised the issue of his CAIFC affiliation. This failed to quell the speculation, as the targets had clear evidence to fall back on, including the above-mentioned annual report from a company controlled personally by Ye, as well as other stock market filings. At that point, the Chairman released the extraordinary personal statement shown below, explicitly denying he had ever worked for CAIFC. He also took the opportunity to refute speculation that he might be a grandson of Marshal Ye Jianying. Due to the appearance of false speculations about me personally, I hereby declare that I did not have the position of CAIFC Deputy Secretary-General between 2003 and 2005. I have not held any position in that association, nor have I ever worked in that association. In 2002 I took the job of Deputy Secretary-General of the China Institute of Cultural Research. Meanwhile I also declare that I am not the son of General Ye Xuanning, nor the grandson of Marshal Ye Jianying. The claim that Chairman Ye has never worked for CAIFC may be true, but only technically so. His position was actually with the Shanghai Association for International Friendly Contact (SAIFC), formerly known as the CAIFC Shanghai Branch, which is very much part of the CAIFC system. Moreover, yearly audit reports from one of CEFC’s charitable enterprises (H/T Mark Stokes) appear to show Ye Jianming still holding the position of SAIFC Deputy Secretary-General as recently as 2014. His right-hand man Chen Qiutu (陈秋途, aka Chauto Chan) holds a matching position in SAIFC, per Huaxin’s official website as of April 2014. The future of the GPD-LD has been unclear since the PLA’s structural reforms introduced under Xi Jinping. Its director, Lt-Gen Xing Yunming is believed to have been in detention for corruption since 2014, with no sign of a replacement being appointed. Overseas Chinese media have recently reported anonymous sources saying the GPD-LD’s intelligence operations have been moved to the PLA’s new Strategic Support Force, with the remainder of its staff de-commissioned and incorporated into the civilian CCP International Liaison Department. If that is accurate, the GPD-LD would appear to have effectively been disbanded, for now at least. Given CEFC’s apparent links with the CAIFC system, this raises a puzzle: why would the company’s fortunes have risen so quickly, while those of the GPD-LD have seemingly tumbled with equal speed? Several signs suggest the rise of Chairman Ye may be linked to the rise of Chairman Xi. The observant Fortune interviewers who visited Ye’s office noted, hanging on the wall, “Xi Jinping’s framed calligraphy from his time leading Ye’s home Fujian province 15 years ago.” A longstanding familiarity between the two would be one explanation for this. Indeed, the trajectory of CEFC/Huaxin has basically tracked that of Xi within the party — roots in Xi’s Fujian, setting up in Shanghai following Xi’s brief interregnum there as party secretary in 2007, and explosive growth after 2010, when Xi became Vice Chairman of the Central Military Commission and anointed successor to Hu Jintao. In 2013, the year after Xi assumed the CCP leadership, the company’s turnover increased 148% to RMB 209 billion. Other signs suggest the Two Chairmen may have a working relationship. To the extent that CEFC/Huaxin is in fact a nominally private enterprise in an industry dominated by SOEs, its rise arguably accords with Xi’s economic reform efforts. While that sort of domestic role is debatable, it is quite clear Chairman Ye has spearheaded a major advance for Chairman Xi’s signature foreign policy project, One Belt One Road. In 2015 CEFC/Huaxin launched a $1.5 billion investment spree in the Czech Republic, setting up large finance vehicles, acquiring a major football team, the largest brewery in the country that invented pilsner, a stake in an airline, plus other acquisitions in real estate, retail, hotels, and the Czech media, which have traditionally been rather critical of Beijing. The company has set up a second headquarters there as a “a bridgehead for developing international investment banking in Europe.” Ye Jianming has even been appointed as an adviser to the Czech President Milos Zeman. Chairman Ye’s work paved the way for Chairman Xi’s triumphant three-day trip to Prague in March 2016 — the first-ever state visit by a PRC leader in 67 years of often testy bilateral relations. This established the country as China’s “gateway to Europe” and a key link in the Belt and Road initiative. CEFC/Huaxin has also established “major strategic bases” in Georgia and Kazakhstan, the latter being another key Silk Road Economic Belt country. Premier Li Keqiang and his Kazakh counterpart even attended the signing of a major 2016 deal between CEFC and the latter’s state oil company. When the Beijing News visited Chairman Ye’s home village, they found “quotations of Ye Jianming’s thought” (叶简明思想语录) on a large billboard. The pages of CEFC company publications, such as its study journal, are replete with paeans to this system of ideas, and if it appears vacuous or incoherent at first, there are good reason to try to understand it. Not only does it express the internal logic of a massive, expanding and still opaque international conglomerate, but being so young, there are few limits on how significant Ye could become in the future. All things in the universe start with power and end with goodness. The first law of the universe is the law of gravity, and attraction is likewise vital to an organization. Concentrating all forces towards a single point maximizes the organization’s gravity, allowing it to become a great enterprise. Organizational gravity must be used for the good which, in turn, comes in two forms: greater good and lesser good. The greater good is that of the state and the nation. As an enterprise of the nation, our objective is to expand our national interests. The lesser good is the individual achievements made while working towards the greater good. The broader corpus of Ye Jianming Thought has been helpfully presented in 21 pithy quotations by the company’s propaganda department, in both English and Chinese: Abstract of Speeches Delivered by Chairman Ye Jianming in Several Meetings (叶简明主席在几次会议上的讲话摘要). Leaving aside any logical issues or problematic moral standpoints, it appears to me that Chairman Ye may be trying positioning himself as a serious Marxist-Leninist-Maoist thinker for the Xi era and beyond. If he decides to step out of the shadows on a more permanent basis, i wonder whether CEFC employees will be the only students of Ye Jianming Thought in the future. While i didn’t take up the generous offers of paid travel, i did suggest meeting up on my next visit to China, and i contributed (remotely) a discussion paper on the nine-dash line to a conference the CEFC think tank organized on the South China Sea issue. When i passed through Shanghai on a fieldwork trip in April, the company’s representatives kindly took me out to lunch, and brought me to the company’s headquarters for a highly formal meeting with the company’s Party Secretary Jiang Chunyu, observed by several other employees, and multiple photographers. The secretary and other representatives emphasized that the company is a private enterprise whose interests naturally align with those of the party-state’s, and that Chairman Ye’s astonishing success is a result of his superb “quality” (素质). After a brief tour of the ground floor of the complex, i continued on my journey, safely none the wiser as to the nature or provenance of the company. NIce digging, love it. 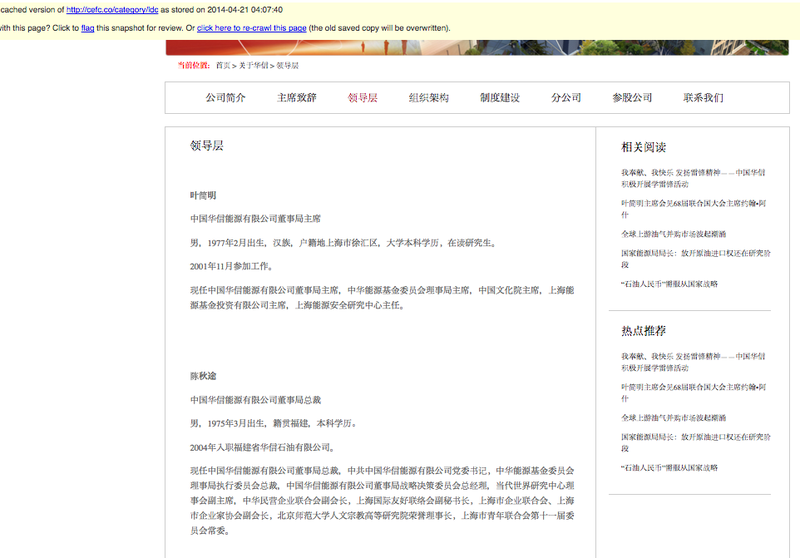 U r lucky, at least WordPress is not blocked by the PRC gov, whether Chairman Ye has anything to do with it or not.